يقع Holiday Inn & Suites Port Moresby ضمن حدائق ذات مناظر طبيعية تبلغ مساحتها 12 فداناً، ويضم مسبح وناد للياقة البدنية وسبا نهاري ومطعم. كما تحتوي جميع أماكن الإقامة على شرفة وتلفزيون بشاشة مسطحة مع قنوات الكابل. يقع Holiday Inn & Suites في منطقة بورت مورسبي الحكومية على بُعد 10 دقائق بالسيارة من المفوضية العليا لجزر سليمان والمفوضية العليا الاسترالية والمفوضية العليا البريطانية. تحتوي جميع أماكن الإقامة المكيفة على ثلاجة ومرافق لصنع الشاي / القهوة ومنطقة لتناول الطعام. كما تحتوي جميعها أيضاً على حمام خاص مع حوض استحمام ومجفف شعر. وتوفر بعض أماكن الإقامة إطلالات على الحديقة. يفتح مطعم Kopi Haus أبوابه على الفطور والغداء والعشاء، ويقدم بوفيهات ومأكولات انتقائية. ويضم فناء مُغطى مُطل على المسبح. يتميز بار Oasis بتقديم المشروبات والوجبات الخفيفة بجوار المسبح. ويفتح بار ونادي Junction الليلي أبوابه بشكل يومي. يوفر مركز اللياقة البدنية ملعب تنس وملعب اسكواش ودروس للياقة البدنية. يتمتع الضيوف بخدمة نقل المطار المجانية من وإلى مطار جاكسونز الدولي الذي يقع على بُعد 15 دقيقة بالسيارة. تتوفر خدمة النقل مجاناً من وإلى مطار بورت مورسبي جاكسونز الدولي. يرجى إعلام Holiday Inn & Suites Port Moresby مُسبقاً في حال كنتم ترغبون بالحصول على هذه الخدمة، وذلك باستخدام بيانات الاتصال الواردة في تأكيد الحجز. First trip to PNG and opted for an international brand hotel. Not a bad decision but could have been better. Location is far unless you are serving the government offices. However, thumbs up to their service staff. Everyone speaks English and being super helpful. Rooms were damped, require some maintenance, but generally still ok. Pleasant. No severe negative point. Good gym and swimming pool. Food is acceptable. Location is close to Airport. I have stayed at th Holiday Inn several times now and it is probably the best value 'quality' hotel in town. That said, it is incredibly expensive (~$350 / night) for what you get but that is the norm for Port Moresby. The hotel is usefully situated for various government office buildings (e.g. Planning, Health, Ecuation) but apart from that it doesn't have a massive amount to offer. The food is OK but pretty limited, the pool is small, the gym is quite good and the garden view rooms are pleasant enough. I booked this hotel is because there is free internet. But , when I checked-ing, they told me there is no free internet provided. I am not happy about it. It's cheating customers. 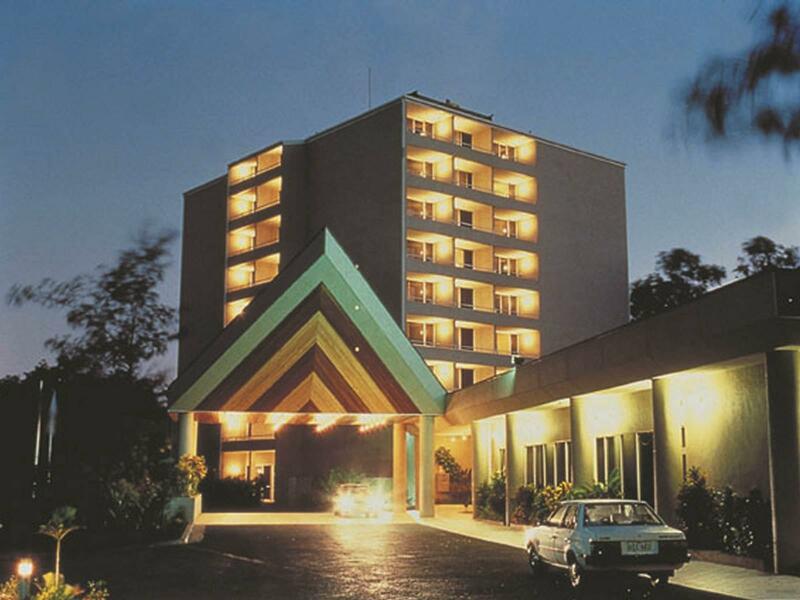 Hotels in Moresby are very ordinary for the money you are forced to pay. The Holiday Inn is a 3 star hotel that gets away with charging 5 star prices. The staff are slow but friendly. My room had no pillow cases but I didn't bother to call reception because I knew that this minor issue would take hours to solve. Size of the compound were good. 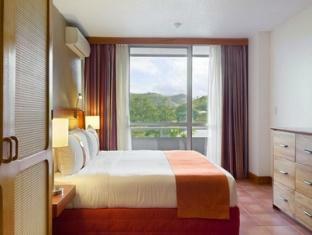 Port Moresby is lacking good accommodation at reasonable rates. The Holiday Inn is probably the best of a bad bunch, however with two new towers under construction hopefully rates will become more reasonable. Comfortable room. Courteous staff. Quick access and shuttle to airport. The conference/meeting room is great and easy to access for quick and even impromptu meetings. The only cons were that it took longer than I had anticipated to check in. When I arrived, there were four guests trying to check in and it took quite a while to get everyone checked in (maybe 25 minutes). Also, the elevators looked a bit run down, although they did work well. friendly staffs. food expensive and everyday roughly the same food! at the price, you should be able to expect better. reception staff's uniforms were old, frayed and faded - how much would new ones cost? bathroom fittings cracked, and traces of mould. staff service was always friendly, but not necessarily efficient. Not set up for business people. The wireless only works if you are sitting at one of the three desks in the business center, at the pool-side bar, or on a backless sofa in the lobby. The rooms are dirty, as are the hallways. The breakfast consists of toast and watery scrambled eggs. I realize there are not many options in Post Moresby, but this place doesn't do the Holiday Inn brand any favors. according to locals the lng project has given port moresby hotels the opportunity to charge a premium for accommodation; certainly the price was very high for an average hotel. the hotel was pleasant and secure though common areas like halls were in need of new carpet and paint. 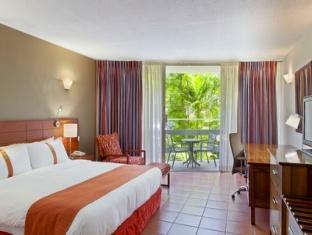 the rooms seemed to have been recently refurbished with very comfortable beds. the bathrooms were in need of some work though. Most aspects of my visit, as a female, solo business traveller were pleasant enough.